Kansas State University scientists recently completed a study on the brown recluse spider, which can be found indoors and outside throughout the Midwest, including Kansas and Missouri. The photo shows its size in relation to a quarter. – Photo courtesy of K-State Research and Extension. Kansas State University researchers provide 10 facts about the well-publicized spiders. MANHATTAN, Kan. – ‘Tis the season – for creepy, crawly things that seemingly come from nowhere. And one to watch for is the brown recluse spider. “A number of things are not well known or have been misunderstood about the brown recluse spider,” said Holly Davis, research associate and Ph.D. candidate in Kansas State University’s Department of Entomology. She, along with associate professor of entomology Jeff Whitworth recently completed research in an effort to better understand and manage the brown recluse. The team shared 10 facts about the much-publicized spider. Brown recluse spiders are mostly only active from March through October, so trying to control them from October through March is generally not necessary or useful. They are found outdoors in Kansas and other Midwestern states, as well as within structures. They tend to thrive in the same environments that humans do. They enter structures either by crawling in from the outside or are brought in on furniture and boxes from other infested structures. They readily feed on prey that is dead, so are attracted to recently killed insects. However, they can and will also attack live prey. Brown recluses build small, irregular webs in out-of-the-way places but do not use these to capture prey. They tend to hide in the dark and move around at night searching for prey. A brown recluse is tiny when it first emerges from the egg case and takes several molts to reach adulthood, 6-12 months. Remember, they are only active from March to October so this may take one to two years. Then they may live 2-3 years as adults. Females can produce 2-5 egg cases during this time (two or three is most common) and each may contain 20-50 spiderlings. Brown recluse spiders are venomous but bites do not always result in large, necrotic lesions where surrounding tissue dies. Often, the bite goes unnoticed and only results in a pimple-like swelling. However, some people develop a necrotic wound (with blood and pus) which is slow to heal, with the potential for a secondary infection. If you know you’ve been bitten, catch the spider if safely possible, and show it to medical personnel for clear identification. Sticky traps for spiders and other insects, available at most hardware and garden stores, work well to trap brown recluse spiders. They may not significantly reduce the numbers, but definitely help, and are a great way to detect and monitor the spider populations. Insecticides labeled to control brown recluse spiders kill the spiders, but must be sprayed directly on them, or the spider needs to come into direct contact with the treated area while it is still damp. Otherwise, little control is achieved. Brown recluse spiders are better controlled with insecticides on non-carpeted surfaces. Preventative measures like sealing cracks in foundations and walls, clearing clutter in and around the home, moving woodpiles away from the house, placing sticky traps in low traffic areas and spraying pesticides can help eliminate brown recluse populations within the home. 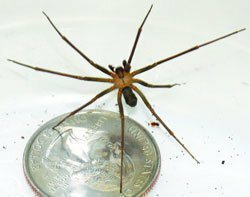 More information and photos of brown recluse spiders are available in a K-State Research and Extension publication online at: http://www.ksre.ksu.edu/bookstore/Item.aspx?catId=526&pubId=17481.